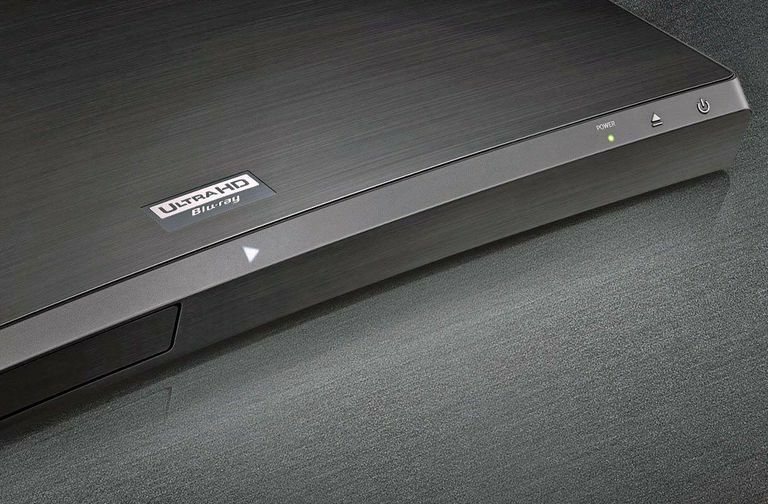 Samsung M9500 Ultra HD Blu-ray Player. If you've experienced the appeal of Blu-ray, you're likely familiar with the next level player in the genre — Ultra HD Blu-ray. These players bring elevated performance that goes beyond current Blu-ray Disc capabilities. However, before you rush out to buy one of these players, there are some important things that you need to know. Native Resolution Output - 4K (2160p - 3840x2160 pixels). Disc Capacity - 66GB (dual-layer) or 100GB (triple layer) storage capacity, as required by content length and features. By comparison, the standard Blu-ray Disc format supports 25GB single layer or 50GB dual layer storage. This means that in order to squeeze more storage on an Ultra HD Blu-ray disc, the "pits" that contain the stored video and audio information have to be much smaller, which means they can't be read by a standard Blu-ray Disc player. Video Format - HEVC (H.265) codec. The standard Blu-ray Disc format uses the AVC (2D), MVC (3D), or VC-1 video codec. Frame Rate - Support is provided for 60Hz frame rates. Color Formats - 10-Bit color depth (BT.2020), and HDR (High Dynamic Range) video enhancement (such as Dolby Vision and HDR10) is supported. Standard Blu-ray supports up to BT.709 color specifications. Video Transfer Rate - Up to 128mbps (actual transfer speeds will vary depending on the studio issuing the content). By comparison, standard Blu-ray supports up to a 36mbps transfer rate. Audio Support - All current Blu-ray compatible audio formats are supported, including object-based formats, such as Dolby Atmos and DTS:X. Although standard Blu-ray discs and players are also compatible with these formats, they will be more fully implemented as part of the Ultra HD Blu-ray playback experience. Physical Connectivity - HDMI 2.0a outputs with HDCP 2.2 copy-protection is the standard for audio/video connectivity. The standard Blu-ray Disc format supports up to HDMI ver 1.4a. As of the original publish date of this article, the inclusion of 3D is not part of part of the Ultra HD Blu-ray Disc format specification. The most important thing to point out is that Ultra HD Blu-ray Discs will not be playable on current/previous Blu-ray Disc players due to the characteristics outlined in the previous section. However, the good news is that if you purchase an Ultra HD Blu-ray Disc player, you don't have to throw out your current Blu-ray Disc or DVD collection. As it stands now (and for the foreseeable future) all Ultra HD Blu-ray Disc players are backward compatible with current 2D/3D Blu-ray Discs, DVD (including the DVD+R/+RW/DVD-R/-RW (except DVD-RW VR mode recordable DVD formats), and standard audio CDs. Also, 4K upscaling is provided for the player of standard Blu-ray Discs, and both 1080p and 4K upscaling is possible for DVDs. In addition to the implementation of the Ultra HD Blu-ray Disc format, Ultra HD Blu-ray Discs are allowed to include the following optional features. Internet Streaming - Just was with most current Blu-ray Disc players, manufacturers still have the option of including internet streaming capability on Ultra HD Blu-ray players. Such players will also have the ability to stream 4K content from services, such as Netflix. Signs are that this capability will be included in all Ultra HD Blu-ray Disc players. Digital Bridge - Another interesting feature that is authorized for use in Ultra HD Blu-ray Disc players, is a feature called "Digital Bridge". Manufacturers can elect to either provide or not provide it. The first generation of players being released throughout 2016, it looks like none seem to include this feature. What "Digital Bridge" allows, if implemented, owners of Ultra HD Blu-ray discs to view their content on a variety of in-home and mobile devices. Details on how this feature would be implemented are not complete, but indications are that it may involve the capability of copying the contents of a purchased Ultra HD Blu-ray Disc onto a hard drive built into the Blu-ray Disc player, and allowing to contents to be playable (with some sort of further copy-protection limitations) over a home network or streamed to a select number of compatible devices. Stay tuned for more info as it becomes available. In order to get the full benefit of Ultra HD Blu-ray Disc playback, you need a 4K Ultra HD TV that needs to be compliant with Blu-ray Ultra HD standards. Most 4K Ultra HD TVs manufactured from 2015 going forward comply with these standards. However, not all Ultra HD TVs are HDR compatible, and the most optimized compatible TVs will be carrying the Ultra HD Premium Label or similar monikers, such as the SUHD label Samsung uses. In cases where a 4K Ultra HD TV does not meet minimal standards for HDR and Wide Color Gamut performance, consumers will still be able to access the 4K resolution portion of Ultra HD Blu-ray Disc content. If you want to purchase an Ultra HD Blu-ray Disc player now and upgrade to a compatible 4K Ultra HD TV later, the player will still work with a standard HDTV (HDMI connectivity required) or non-fully-compliant 4K Ultra HD TV. However, with such TVs, you will not get the full benefits of an Ultra HD Blu-ray Disc player. Standard Blu-ray Discs and DVDs will still look fine, but with 1080p TVs, Blu-ray Discs will output at a maximum native 1080p resolution and DVDs will be upscaled to 1080p -- with 4K Ultra HD TVs, Blu-rays and DVDs will be upscale-able to 4K. Also, any 4K Ultra HD Blu-ray Disc content will be downscaled to 1080p for display on an HDTV. A non-fully compliant 4K Ultra HD TV will display the content in 4K, but the Wide Color Gamut and HDR information will just be ignored. The Ultra HD Blu-ray Disc format and Players are compatible with most home theater receivers that have HDMI inputs. Also, at the manufacturer's discretion, each play may provide as many as two HDMI outputs (one for video and one for audio) and/or a digital optical output may also be provided as an alternate audio connection. In cases where two HDMI outputs are provided, this provides more flexibility with home theater receivers that may be 4K compatible, but not compliant with Ultra HD Blu-ray standards. In this case, you would connect one HDMI output of the player to a compliant 4K Ultra HD TV directly for the video portion, and then connect the audio-only HDMI output to your home theater receiver for accessing the audio portion of the disc content. If you have a pre-HDMI home theater receiver, you would need to make sure to get an Ultra HD Blu-ray Disc player that also offers the digital optical output option as that would be the only way for you to access the audio portion of the played content. However, there is more. For full audio compatibility (access to the Dolby Atmos or DTS:X surround sound formats) that may be included on specific Ultra HD Blu-ray Disc titles, you would need to have a home theater receiver that has built-in Dolby Atmos or DTS:X decoders. Even if your home theater receiver is not compatible with Dolby Atmos or DTS:X (and not all Ultra HD Blu-ray Disc movies may include these options), if it has built-in Dolby TrueHD and DTS-HD Master Audio decoders, you are OK also, as the player will default to those formats if it detects that the connected home theater receiver does not provide the proper decoder. The only "glitch" comes when you have to use the digital optical connection option, as that connection will only be able to pass a standard Dolby Digital/EX or DTS Digital Surround/ES surround sound format signals. How Much Does an Ultra HD Blu-ray Player Cost? So, after soaking in all the info presented above, you are ready to make the plunge into Ultra HD Blu-ray. If you have the proper TV and Home Theater receiver to get the most out your viewing and listening experience, the price of entry for most Ultra HD Blu-ray Disc players is between $100 and $300 -- although higher-end models, with added features, may cost more. When you consider that the first Blu-ray Disc players came at $1,000 or more -- this is a real bargain, for the big jump in video quality.